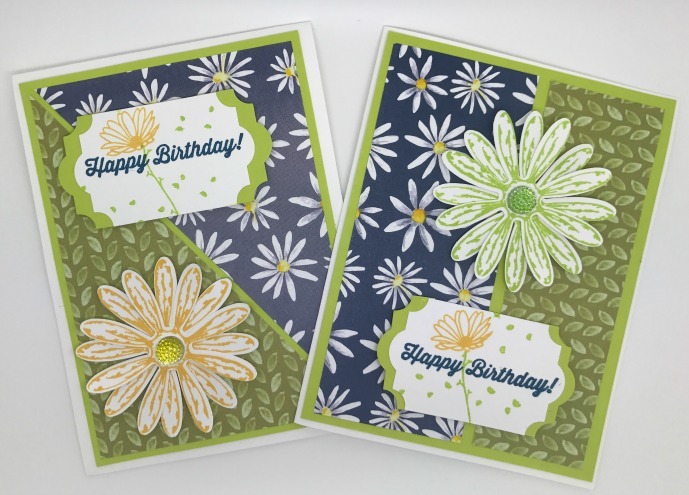 The Daisy cards were created using the Daisy Delight stamps and Daisy punch from Stampin Up!. A similar design can be created with other flower punches and stamps. It is such as easy way to make a stunning card with a fresh vibrant look. The cards use one sheet of pretty designer paper. As these sheets have a different pattern on each side you can use both sides of the paper in your design. They co-ordinate wonderfully with each other. The 12" x 12" sheet was cut using a "One Sheet Wonder" template from Seonsook Duncan to provide enough paper shapes for up to 8 separate cards. "One Sheet Wonder" (OSW) refers to the division of patterned paper with minimal or no waste. It is a quick and easy way to make several cards. Have a go at creating your own OSW! Stamp two daisy images onto white card for each flower. Cut out with the Daisy punch. Join the two daisy's together (offsetting the petals slightly) using a glue dot to give more depth to your flower. Curling the flower petals upwards slightly with a bone folder will make the daisy pop out from the card. Use different sentiment stamps to provide cards for various occasions. Make the banners for the sentiments. They were made with either the Banner Triple punch or the Every Day Label punch both from Stampin Up!. Bright yellow coloured ribbon adds a special touch to your layer. 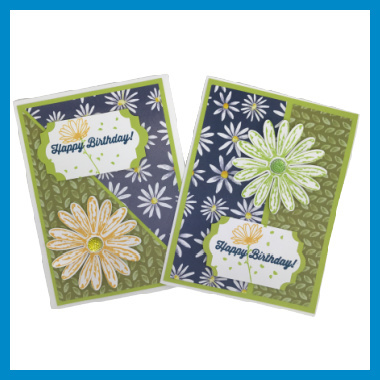 Add the daisy flower and the banners to the card with foam pads to create a 2D effect. To finish add faceted gems to make the daisy centres sparkle. Colour with a permanent Sharpie pen (available from local supermarkets) to match your card.